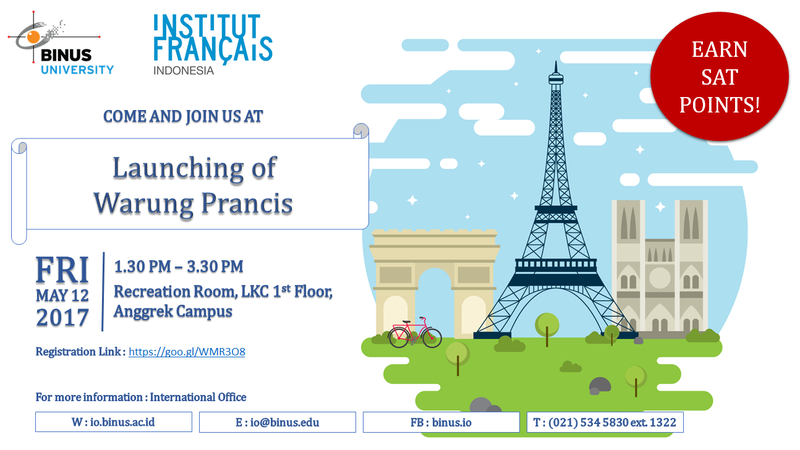 On 12th May 2017, BINUS UNIVERSITY is set to launch ‘Warung Prancis’ at its Anggrek campus, a self-contained French-themed open area that is aimed at promoting greater collaboration between BINUS UNIVERSITY and Institut Français d’Indonésie (IFI). The Warung Prancis initiative is the latest measure from BINUS UNIVERSITY in strengthening ties with the French higher education sector in which BINUS UNIVERSITY is currently a member of the French Indonesian Consortium for Engineering and Management; BINUS UNIVERSITY is also an active participant of the Joint Working Group programme that is organised by the governments of Indonesia and France as part of the Indonesian-French Cooperation in Higher Education and Research annual meeting. Prominent attendees scheduled at the event will be the Director of the IFI, Mr Marc Piton and the Director of BINUS Global, Ms Karen Imam. As such, Warung Prancis, will provide information regarding exchange programmes as well as technology transfer initiatives for students and staff, further cementing BINUS UNIVERSITY’s capacity to engage with leading international partners to build upon its success in producing globally-minded graduates. As part of Warung Prancis, BINUS UNIVERSITY is set to showcase the success of its current cooperation with renowned French universities namely the Burgundy School of Business, IESEG School of Management, ISTC – École de Communication, and the ISC Paris School of Management among many others. The event will feature a guest lecture and knowledge sharing session from BINUS UNIVERSITY’s exchange students currently studying in France who will provide insights into their overseas experience. In 2016, BINUS UNIVERSITY hosted approximately 400 international students in which a large majority of the student intake came from France, the Netherlands, and South Korea. With an annual increase in the number of students, particularly from France, this trend thus illustrates a keen interest on the higher education learning system amongst enrolled university students in Indonesia as well as France. Furthermore, Warung Prancis will also make available information on French culture, student life in France, and scholarships offered by the French government; France is increasingly becoming a popular education destination for Indonesian students. Through Warung Prancis, BINUS UNIVERSITY hopes to expand its growing network of international partners. In strengthening its relationship with its French university partners, BINUS UNIVERSITY will better equip its students in attaining knowledge, skills, and network to succeed as global industry leaders.